Investors can use a few select ETFs that cover the major asset classes to construct an effective portfolio for the long-term. Other securities and funds can then be added to tailor the portfolio for short-term trading or other tactical moves. In such a portfolio, the long-term ETF positions would be regarded as core holdings, while the short-term ones would be viewed as satellite positions that can be liquidated once the short-term tactical investment objectives have been achieved. For example, if an investor is concerned about the short-term impact of a strengthening domestic currency on the international component of her portfolio, she can add the appropriate currency ETF to her portfolio and sell it when she believes the currency has peaked. 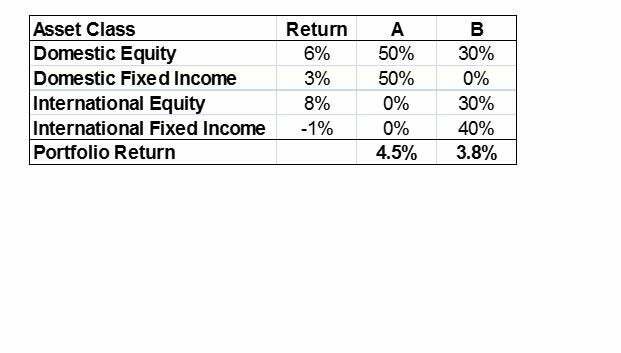 For example, the Table below shows the asset allocation for two investors A and B. While B has a total allocation of 60% to the better-performing equities category compared with 50% for A, the latter manages to outperform B’s portfolio by 0.7 percentage points because there is zero allocation to the worst-performing category, International Fixed Income. While the debate between active and passive investment management is a timeless one that will continue to rage on, ETFs can be used to get the best of both worlds. Active management provides the opportunity for outperforming the market or generating alpha, while index funds can only match the beta, or overall market / sector returns. However, active management comes with a considerable price tag, while index funds are more cost-effective. ETFs can be used to construct portfolios that offer a blend of active and passive management, with the mix adjusted to specific clients’ investment objectives, time horizon, risk tolerance and other preferences. One of the biggest benefits of ETFs is that it gives average investors access to hedging strategies that were formerly the exclusive domain of institutions and large investors. Inverse ETFs, leveraged ETFs, and currency ETFs can be used to hedge the broad portfolios or specific sectors within it. This is a fancy term for a straightforward concept. Cash equitization or equalization refers to the strategy of temporarily parking a large amount of cash in an ETF that has approximately the same asset class exposure and target risk desired by the investor, before investing it for the long term. Institutional investors generally implement this strategy when they have a temporary build-up of cash and want to avoid underperforming their benchmark through “cash drag” (which refers to the drag on performance caused by a large cash position). On the institutional side, this can occur, for instance when an institution is transitioning between managers or is looking for a new manager in a specific asset class. While a retail investor may be faced with a similar issue when transitioning between portfolio managers, cash equitization can also be used to deal with a large cash balance generated through the sale of a house or real estate, or receipt of a bonus. An investor considering cash equitization needs to keep two points kept in mind, however. Firstly, since investing in ETFs carries a significantly higher level of risk than leaving a large sum in cash or cash equivalents, the investor should be cognizant of this greater degree of risk. Secondly, there may be tax implications to getting in and out of the ETF that should be taken into consideration. Selling stocks short is not recommended for the average retail investor because of the many risks and expenses involved. Short selling an ETF is a marginally better alternative for the retail investor, although it must be emphasized that many of the risks of short selling still remain. Since an ETF is a basket of securities, short selling it does not expose the investor to as high a risk of a “short squeeze” as is present when shorting an individual stock. An individual stock can easily spike 50% or more in a day, as for instance when a heavily-shorted biotech stock reports clinical trial results that are much better than expected. An ETF that contains this biotech stock could also rise in this scenario, but to a much smaller extent because it may contain dozens of other stocks that may have widely divergent price moves. Short selling a broad-market or sector-specific ETF may be preferable to buying an inverse ETF in certain cases, where the short position is desired to be held for a longer period of time, since most inverse ETFs are designed to provide the inverse return on an index on a daily basis. However, the investor or trader needs to be exceedingly wary about keeping the short position on for an extended period of time; apart from expenses such as margin interest and the cost of borrowing the ETF, the short seller is also on the hook for dividends and distributions made by the ETF. ETFs can be used for tax optimization strategies in a couple of ways. Investors should pay attention to “asset location,” which refers to the distribution of financial assets between taxable and tax-advantaged accounts. Investors can generate higher after-tax returns by using the simple tactic of buying tax-efficient investments – such as municipal bonds, tax-managed funds and stocks/ETFs purchased for the long term – in taxable accounts, so as to reduce the amount of tax payable. Likewise, tax-inefficient investments – like REITs, taxable bonds, short-term stock/ETF trading positions, and commodities – should be purchased in tax-advantaged accounts. Another aspect of tax optimization has to do with “tax-loss harvesting.” This refers to the strategy of realizing capital losses in a taxable account and redeploying the sale proceeds among similar investors so as to have approximately the same asset class and risk exposure as before. The “wash-sale” rule makes ETFs especially suitable for this strategy. The rule prevents an investor from selling a security at a loss and then immediately repurchasing it by disallowing the purchase of “substantially identical” securities within 30 days of a sale. The wide range of ETFs available means that it is comparatively easy to acquire an ETF that is quite similar in asset composition and risk profile to the mutual fund or stock being sold, but is fundamentally different enough to avoid triggering the wash sale rule. An important caveat – please consult your financial advisor or tax expert before embarking on any tax optimization strategy to ensure that it is the appropriate one for you. Portfolio completion strategies can be used to fill gaps in a client’s portfolio and thus “complete” it. ETFs can be effectively used to gain exposure to specific sectors, investment styles or asset classes even if the investor does not have the requisite expertise in these areas. This is especially relevant for more challenging investments such as emerging markets, high yield bonds and commodities, where the plethora of ETF choices available makes it fairly simple for an investor to pick the right one for his or her investment objectives. Many financial advisors also use ETFs to implement portfolio completion strategies in situations where a full rebalancing of client portfolios is temporarily precluded by tax consequences, trading restrictions or manager changes. ETFs can also be used to implement market rotation or sector rotation quickly and efficiently. For example, an investor who wants to increase exposure to European equities and reduce U.S. holdings (perhaps based on the view that valuations are better in Europe) can do so by buying an ETF that tracks an European index, and selling current ETF holdings that follow U.S. indices. ETFs can also be used to switch from growth stocks to value stocks, or the other way around. Sector rotation can also be easily achieved using sectors, for example, exiting the health care sector and getting into financials. A portfolio can be given a more defensive or cyclical tilt without making wholesale changes to it, by using ETFs as an overlay on top of the full portfolio. For example, an investor who wishes to achieve a more defensive tilt without rebalancing the existing portfolio can do so by buying additional ETFs that are invested in low volatility stocks, or ETFs that track traditional defensive sectors such as consumer staples and utilities. ETFs can be used to construct a portfolio that meets almost any type of investment objective. Here's a quick guide. Although more detail and attention may be needed, ETFs can be shorted - and at a great profit.